The famous and sparkling blue Pangong Lake is situated near Leh-Ladakh in the Himalayas, approximately at the height of 4350 meters. This endothecia lake is 12 kilometers long and extends from India to Tibet, with two-thirds of it lying in the latter. Owing to its altitude, the Pangong Lake temperature ranges from -5°C to 10°C as a result of which it freezes completely during winters in spite of its salinity. A unique feature of the lake is that it does not remain blue throughout the year or even the day, rather it changes colors from azure to light blue to green and grey too! 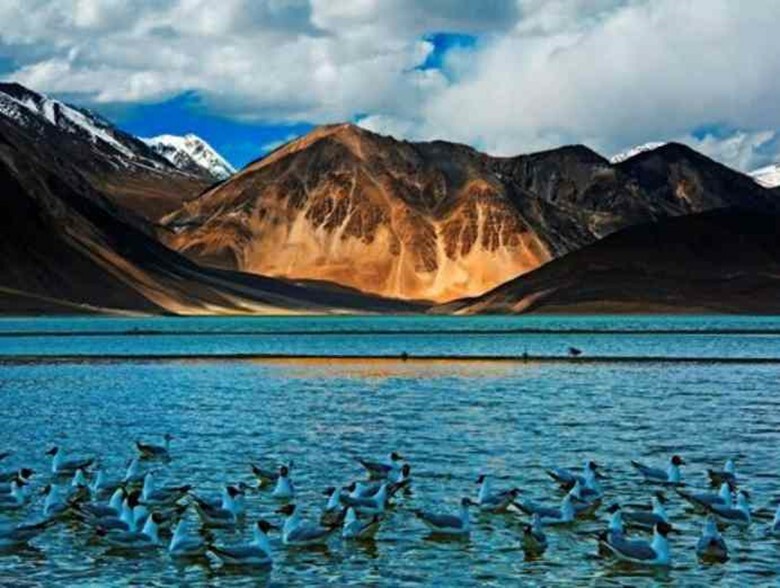 Also known as Pangong Tso, it has been a tourist attraction for a very long time and has gained further popularity after being a ‘hot-spot’ for many film shoots, apart from being essential for anyone travelling to Leh – Ladakh. The sublime beauty, crystal waters and gentle hills of Pangong Lake are an exceptional example of the beautiful landscape of the region. There are two streams from the Indian side that form the wetlands and marshes at the edges. 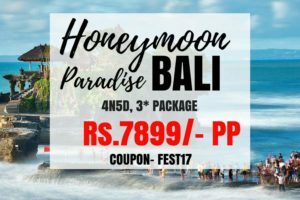 It is the beauty of the impeccable blue waters that embezzle the tourist’s attention the most. The serenity and tranquility of Pangong Lake are the tourist’s paradise. Also known as Deskit/ Diskit Gompa, this is the oldest and largest monastery in Nubra valley, belonging to Gelugpa (yellow hat) sect of Tibetan Buddhism. The monastery was founded by Changzeb Tserab Zaongpo, the disciple of Tsong Khapa who was the founder of Gelukpa. As you will step on the rocky stairs towards the hill top, it would lead you to the prayer hall adorned by the statue of Maitreya Buddha, huge drums and several images of fierce guardian deities. 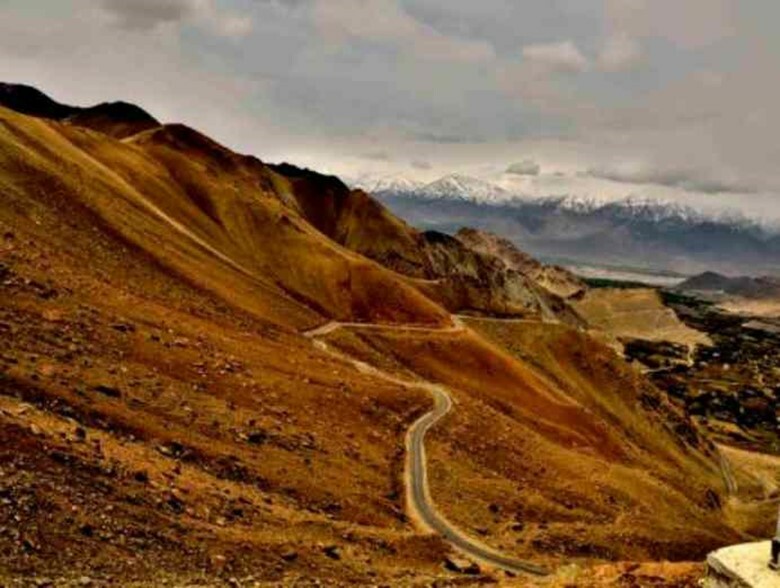 Because of the river Shyok flowing at the foot hills and rich green vegetation in the vicinity, Diksit has been named as “The orchard of Ladakh”. Diksit monastery also has a school which is run in collaboration with an NGO named “The Tibet support group”. The school provides computer facilities and also teaches the Tibetan kids science in English language. The Monastery is renowned for its festival “Dosmoche” or the festival of scape goat. In the festival the monks perform the mask dances expressing the power of Goodness over evil. It is said that this dance form eradicates bad luck. Apart from this, images made from dough are also thrown out to usher peace and the clothes of the idols are also changed during this time. The festival is organized during February and usually it’s only the people of Nubra valley who attend it because the heavy snowfall that results in a cut off of the region with other places. And to embrace Buddhism a bit more you can visit Lachung temple nearby, believed to be the oldest in Nubra and has a large idol of Tsong Khapa. There also is Hundur Monastery located below the main road near the bridge. As you proceed with your somewhat bumpy journey, you will come across not just beautiful scenic views but also the highest desert of the world in Hunder, famous for the Bactrian camel rides. Bactarian camels are of the rarest sort, having two humps and were the major source of transportation in the silk route. In Diksit, you can buy some lovely Kashmiri or Tibetan artifacts, Pashmina shawls, woolen socks, almonds, apricots, apples and other things that define Kashmir. Of course, you can take home the beauty Kashmir is known for, in your memories that you will be cherishing for life. 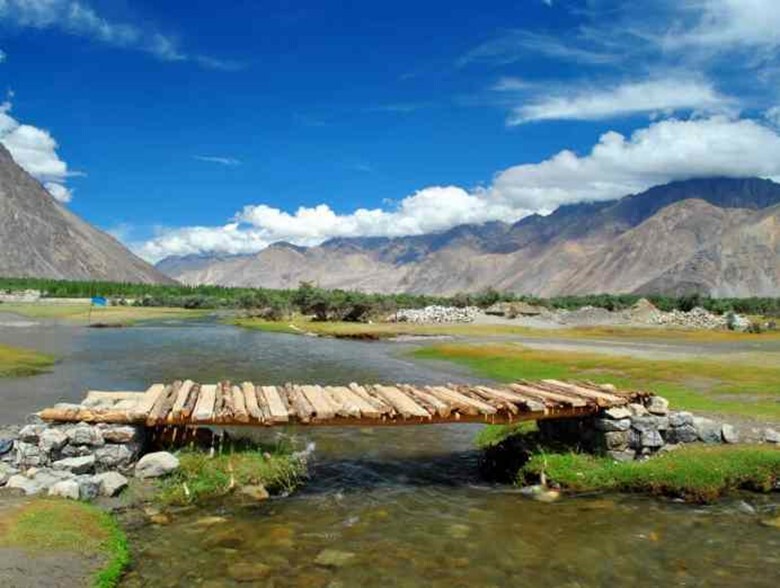 The Suru valley is a valley in the Ladakh region of Jammu and Kashmir. It is drained by the Suru River, a powerful tributary of the Indus River. The valley’s most significant town is Kargil. Despite considerable potential, tourism activity is very limited in the valley with most visitors rushing through to Padum and Zanskar. There are few facilities for visitors but Jammu & Kashmir Tourism does have basic tourist bungalows in several of the villages. and there’s a summer tent-camp in Random. Tangle village is a possible starting point for mountaineering expeditions up Nun Kun. Zanskar Valley is known for its wide views and sceneries, cave monasteries and mostly travelled to for its trekking trails and river rafting experiences and the Suru Valley, the two valleys almost always visited together. Nestled between two tiny alpine lakes, most isolated of all Himalayan valleys, the valley has an area of about 5,000 sq Kames. 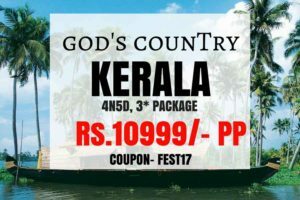 and is situated at an elevation of 13,154 above sea level. This valley seems to be cut off from the rest of the world for over 9 months of the year. 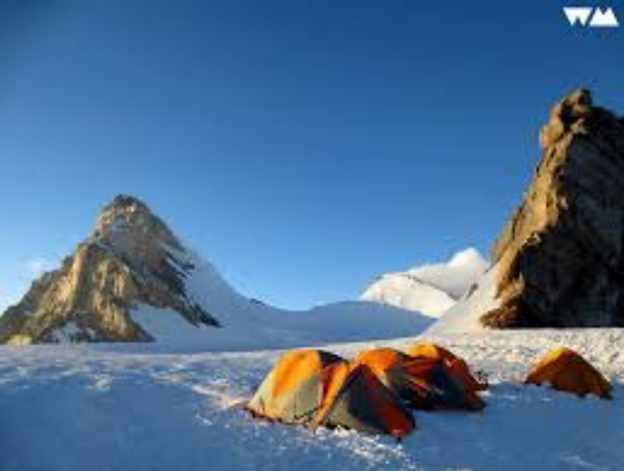 Adventure is the main cause as to why people like Zanskar. River rafting and other sports are very famous here, and Zanskar is known for it clears waters. 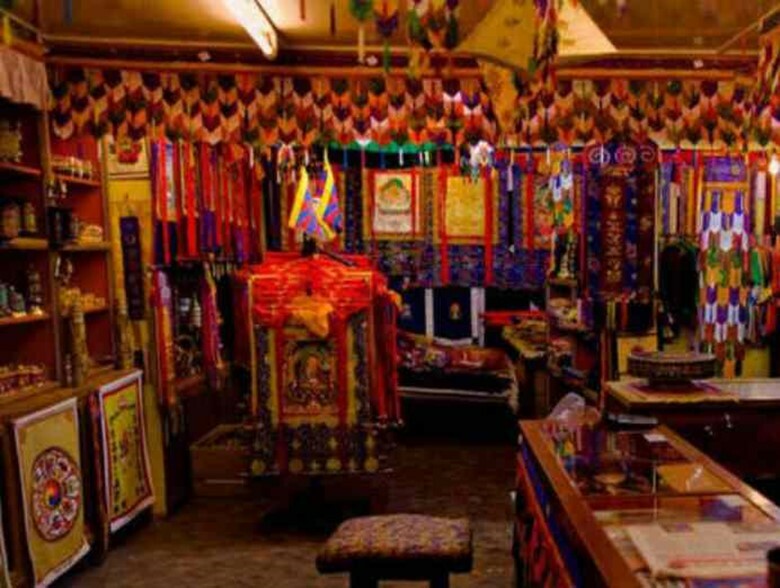 The huge Tibetan population that have made Ladakh its home provides not just a rich infusion to the local culture but also allows everyone a generous peek into their homes and traditions by selling handmade Tibetan artifacts and wares at the markets here. 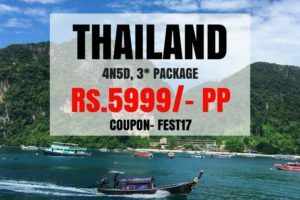 You will be spoilt for choice with intricately painted, eye-catching Thangka paintings that make for beautiful, sacred wall-pieces and meditational means; Buddha statues in different poses and sizes, each with its own significance; mountable Buddha masks; prayer wheels, beads, and flags for chanting or adorning your vehicle; brass and copper ‘chang’ pots with intricate carvings, traditionally used to serve tea or alcoholic beverages (your chance to be fancy at get-togethers? ); carved wooden tables or ‘choktse’ that are painstakingly carved and painted in stunning colors or simply varnished; and bamboo work baskets and cradles of superior quality are some of the things to lookout for while shopping in Leh Ladakh. Thikse Gompa or Thikse Monastery (also transliterated from Ladakhi as Tiksey, Thiksey or Thiksay) is a gompa (Tibetan-style monastery) affiliated with the Gelug sect of Tibetan Buddhism. 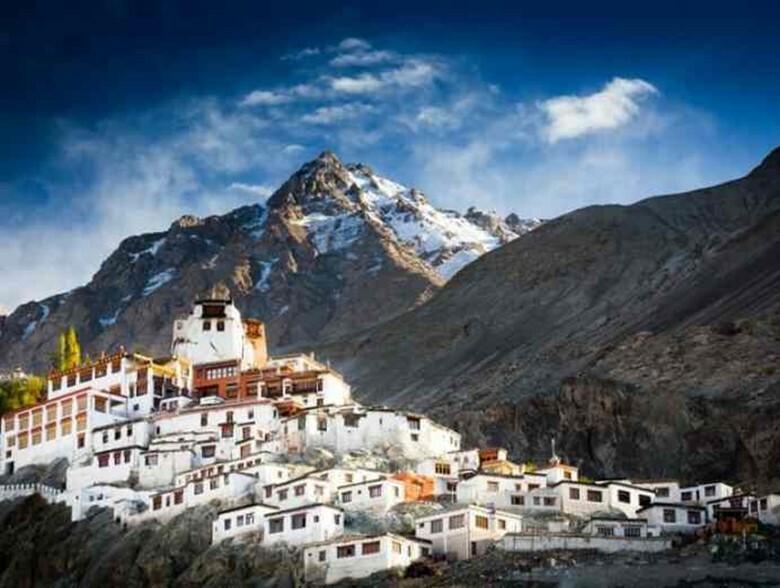 It is located on top of a hill in Thiksey approximately 19 kilometers (12 mi) east of Leh in Ladakh, India. 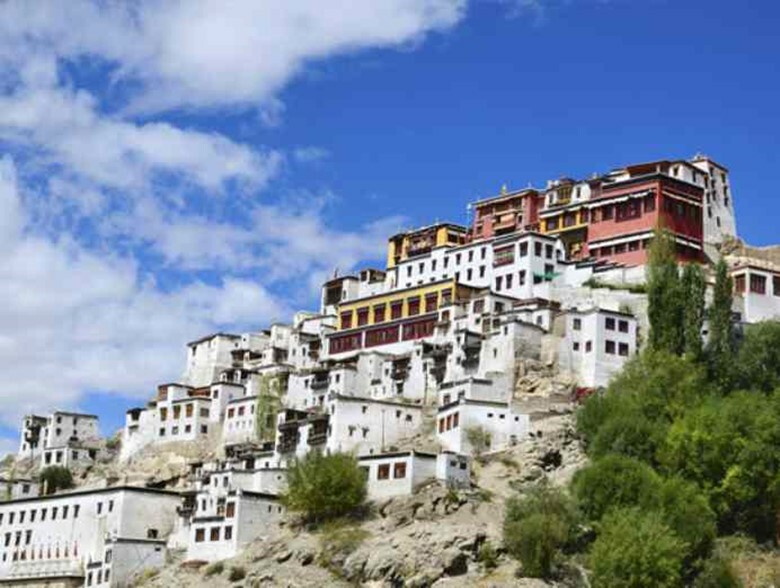 It is noted for its resemblance to the Potala Palace in Lhasa, Tibet and is the largest gompa in central Ladakh, notably containing a separate set of buildings for female renunciates that has been the source of significant recent building and reorganisation. The monastery is located at an altitude of 3,600 meters (11,800 ft) in the Indus Valley. It is a twelve-story complex and houses many items of Buddhist art such as stupes, statues, thangkas, wall paintings and swords. One of the main points of interest is the Maitreya Temple installed to commemorate the visit of the 14th Dalai Lama to this monastery in 1970; it contains a 15 meters (49 ft) high statue of Maitreya, the largest such statue in Ladakh, covering two stories of the building. The Drang-Drung Glacier (also called Durung Drung Glacier) is a mountain glacier near the Pensi La mountain pass at the Kargil – Zanaskar Road]\ in the Kargil district of Jammu and Kashmir in India.The Drang-Drung Glacier is likely to be the largest glacier in Ladakh other than the Siachen Glacier in the Karakoram Range, with a maximum length of 23 kilometers (14 mi) at an average elevation of 4,780 m (15,680 feet). 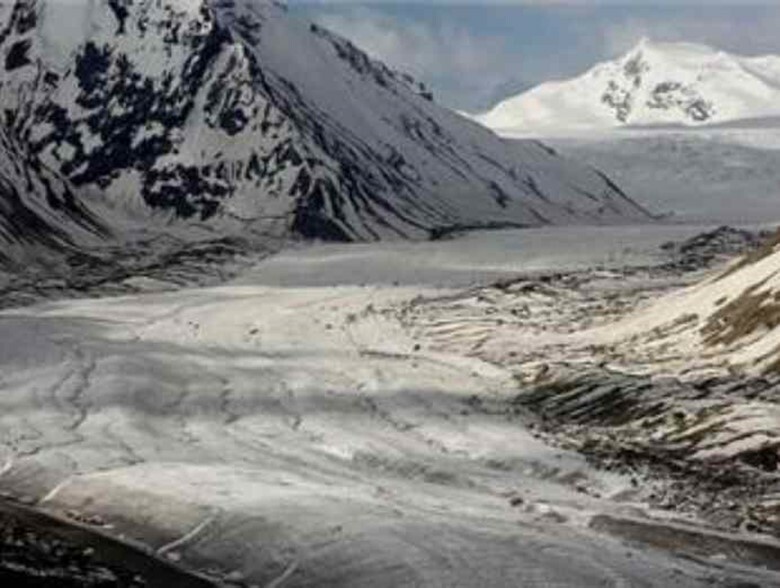 The glacier lies in the northeastern Himalayan Range known as the Zanskar Range, 142 kilometers (88 mi) south of Kargil and 331 kilometers (206 mi) east of Srinagar, the capital of Jammu and Kashmir. 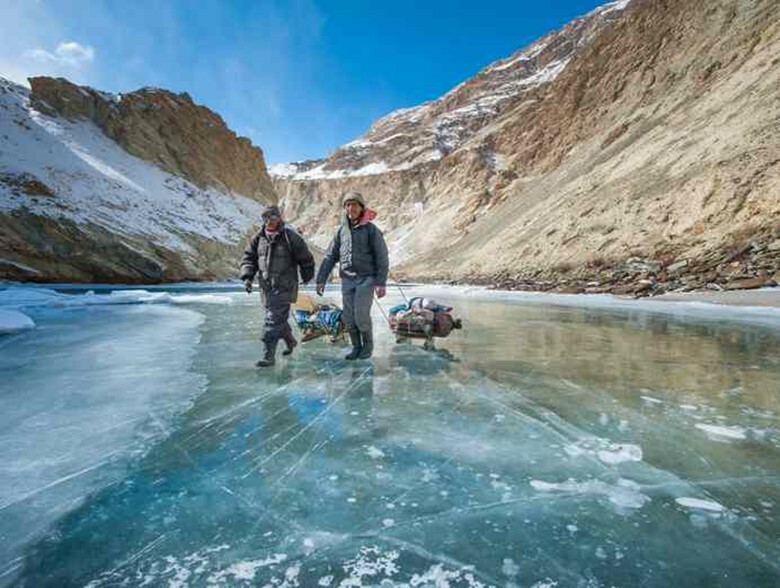 The Drang-Drung Glacier is a long river of ice and snow, a source of the Stod River] which is a tributary of the Zanskar River and the Zanskar River is a tributary of Indus River. Doda Peak with an elevation of 6,550 m (21,490 feet) rises from the glacier. Khardung La (Khardung Pass, la means pass in Tibetan) is a mountain pass in the Ladakh region of the Indian state of Jammu and Kashmir. The local pronunciation is “Khardong La” or “Khardzong La” but, as with most names in Ladakh, the romanised spelling varies.The pass on the Ladakh Range is north of Leh and is the gateway to the Shyok and Nubra valleys. The Siachen Glacier lies part way up the latter valley. Built in 1976, it was opened to public motor vehicles in 1988. Maintained by the Border Roads Organisation, the pass is strategically important to India as it is used to carry supplies to the Siachen Glacier. The elevation of Khardung La is 5,359 m (17,582 ft). Local summit signs and dozens of stores selling shirts in Leh incorrectly claim that its elevation is in the vicinity of 5,602 m (18,379 ft) and that it is the world’s highest motorable pass. Khardong La is historically important as it lies on the major caravan route from Leh to Kashgar in Central Asia. About 10,000 horses and camels used to take the route annually, and a small population of Bactrian camels can still be seen at Hunder, in the area north of the pass. During World War II there was an attempt to transfer war material to China through this route. Changthang Plateau (literally: northern plains) in Jammu and Kashmir in Northern India. The lake and surrounding area are protected as the Tso Moriri Wetland Conservation Reserve.The lake is at an altitude of 4,522 m (14,836 ft). 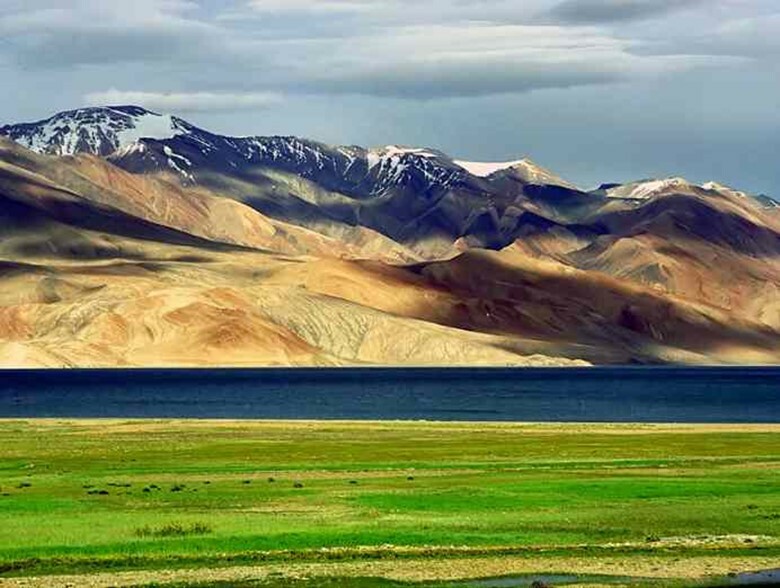 It is the largest of the high altitude lakes entirely within India and entirely within Ladakh in this Trans-Himalayan biogeography region. It is about 16 miles (26 km) north to south in length and two to three miles (3 to 5 km) wide. The lake has no outlet at present and the water is brackish though not very perceptible to taste. The lake is fed by springs and snow-melt from the adjacent mountains. Most water enters the lake in two major stream systems, one entering the lake from the north, the other from the southwest. Both stream systems include extensive marshes where they enter the lake. It formerly had an outlet to the south, but this has become blocked and the lake has become an endothecia lake. The lake is oligotrophic in nature, and its waters are alkaline. Accessibility to the lake is largely limited to summer season, though Karzok on the northwest shore and the military facilities on the eastern shores have year-round habitation.